Posted in News, Testing, under North America. Tagged with ETS, iTEP, SLATE. The number of US private high schools using the iTEP’s SLATE exam for admissions has increased by 300% in a year, it’s owners say. Michael Salenko, iTEP‘s executive director, said 135 schools recognised the SLATE, up from 34 in June 2012, and that the test was filling a “vacuum” left by the retired ETS SLEP exam. 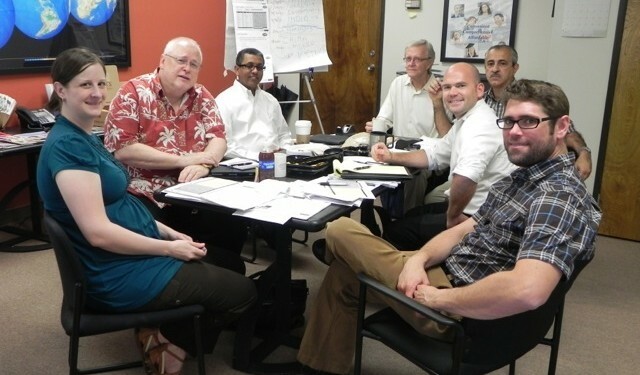 The iTEP team having a strategy meeting at their headquarters in Los Angeles. The SLATE is carried out online and allows schools to gauge proficiency in students, aged roughly between 12 and 16, by assessing both writing and speaking. It is available in 37 countries but can also be administered by schools themselves. It is similar to ETS’ TOEFL Junior test (intended for students ages 11 to 15) but available in more in countries. Salenko said that while not a mandatory requirement for issuing I-20s, the SLATE enabled high schools to understand how well international students would integrate and participate in classes – important as international numbers climbed at secondary level in the US. Launched in 2008, iTEP is a relative minnow in the testing market but is gaining ground on bigger players with its range of business and academic products. It claims to have delivered 100,000 exams in five years and won a contract to provide tests for the Saudi government last year.